Just a heads up. 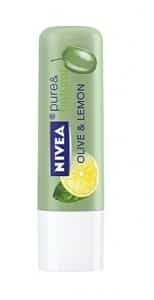 According to the Nivea facebook, at 1pm – Eastern Time/ 10am – Pacific Time, you can click here to visit the “Nivea Olive Oil & Lemon Giveaway” tab to try and score a Free Nivea Pure & Natural Lip Care Product. They’ll be giving them away everyday till Friday to the first 1,000 people that register. Love all your stuff and use you lip care products all the time!! I am not to good on computers??? This brand is great, I can’t wait to try the new product. I would love to try one of these samples. I have been a Nivea fan for a lot of years. I tried for the sample but it came back….page not found! I will try my hardest!! Can not wait.. Love this! you should send all who click on it a sample .greatly increase sales if all .could try it. How do I enter, when I click click here it’s blank! It’s not working for me… has anyone been successful yet? Would love to win this !!! I have tryed so many ther brands to help with dryed lips and they didnt work very well. 1st I was too early,now I am probably too late.But I love Nivea products and sure would like to try this one!